The Twin Bees are the world's No 1 "Sound - Alike" BEE GEES Tribute Show. The Twin Bees perform a tribute to the Bee Gees. Featuring the amazing vocals of Twin Brothers Robert and James Bathgate. 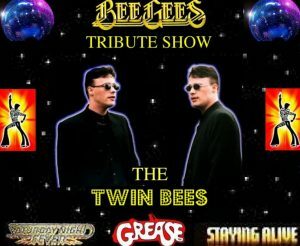 Unlike many of the tribute bands now in vogue the Twin Bees do not attempt to copy the appearance of their idols. The boys feel that they should emphasise the "Sound - Alike" aspect more than the visual one. The Twin Bees are the world's No 1 "Sound - Alike" Bee Gees Tribute Show. 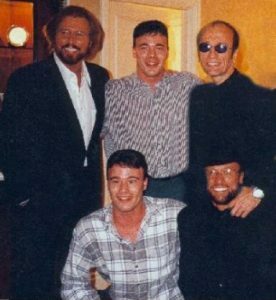 When Barry Gibb first heard them play live he told them "It was so weird hearing someone sing who sounded just like me. There are other tribute bands, but none that quite capture our sound as good as you" Here is what the papers had to say. "Brothers Gibb stung by Twin Bees"- The Sun "Scottish Bee Gees Reach Fever Pitch"- Daily Record “Perfect Harmony”- News of the World The Twin Bees TV and Radio appearances include "Michael Barrymore's "My Kind of Music" "Scottish Music Awards" for the Nordoff -Robbins and on MTV LIVE plus BBC Radio Scotland - Scot FM - Radio Fourth FM - Manx Radio Isle of Man. They have performed to sell out venues over the world, including the Edinburgh Fringe Festival, the York Opera House Theatre, the Villa Marina Royal Hall, and the Wycombe Swan Theatre and the Palace Theatre to name a few. The Twin Bees have amazed Bee Gee fans with their uncanny natural harmonies for over a Decade. Set List includes: To Love Somebody • Massachusetts • Words • I've Gotta Get A Message To You • Jive Talkin' • Stayin' Alive • You Should Be Dancing • How Deep Is Your Love • Night Fever • Too Much Heaven • You Win Again • Immortality • Tragedy, Guilty, Heartbreaker, Chain Reaction, Emotion, Imortality Plus: Hits written for other Artists including -Frankie Valli, Kenny Rodgers, Dolly Parton, Dionne Warwick, Diana Ross, Yvonne Ellerman, Barbara Streisand, Destiny’s Child, Celine Dion, Grease, Islands in the Stream.